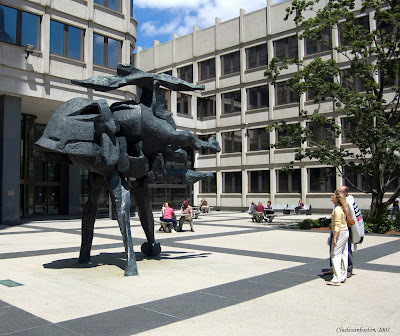 I was taking pictures at the JFK building and of the outdoor sculpture on the plaza yesterday when I was detained briefly by three Homeland Security officers as to why I was taking pictures of the building. The sergeant said it was a security issue because I was taking pictures near an entrance, "and a camera with a good lens could photograph their security procedures." I had to show them my ID while they checked my name and looked at all the pictures on my camera. The guard viewing my pictures, when he saw the sculpture, made a remark about the "ugly sculpture" out front, hence the title for today's post. I know security against terrorism is important, but it seems that simply taking pictures and being questioned by federal authorities for doing so is chilling. I think we might want to remember the words of Pastor Martin Niemoeller as more and more restrictions are applied on society in the name of security. These people are unbelievable! You know why they checked all the photos on your camera? Because they can. Will this country ever find its way back?